Ronda “The Arm Collector” Rousey would still be willing to fight Chris “Cyborg” Santos even if Santos was juiced up with anabolic steroids. Santos was suspended after she tested positive for steroids last year. Rousey’s only condition is that Santos fight at the 135-pound category. In an appearance on “The MMA Report with John Pollock”, Rousey said she believew it would be difficult for Santos to lose weight if she continues to use steroids. Rousey has been highly critical of Santos ever since the Brazilian MMA fighter tested positive for Winstrol metabolites during her fight against Hiroko Yamanaka at Strikeforce: Melendez vs. Masvidal on December 17, 2011. Rousey has been outspoken in her dislike of steroid users. She believes individuals resort to steroids as a consequence of their “insecurity” and “mental weakness”. The Strikeforce women’s bantamweight champion has dominated the sport of mixed martial arts since her MMA debut in August 2010. She has gone undefeated with a record of 4-0. Having broken a few arms along the way, Rousey has earned the nickname “the Arm Collector”. She was voted the 2011 Female Fighter of the Year at the 2011 MMA Awards. 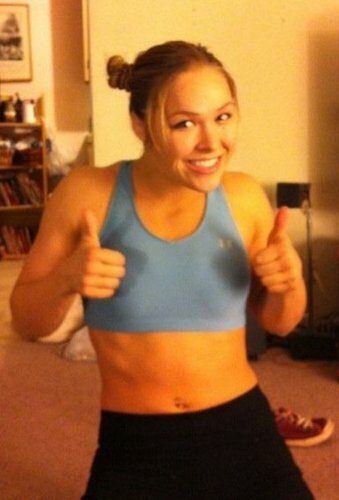 Prior to her MMA career, Rousey was a competitive judoka. She won the bronze medal in judo at the 2008 Beijing Summer Olympics. A bout between Rousey and Santos was highly anticipated prior to Santos’ steroid suspension. As Santos’ one-year suspension comes to an end in December, interest in the match-up has been renewed.